I took some pictures yesterday of my son and I doing some extra stretches and warm up. I have issues with my lower back and have to take extra care to warm up completely before doing planks and squat jumps and what not. Here’s one for the mommies who can’t get away from the kiddos during work out time, just make a game of it. On another note, one of my very favorite foods is salad. Thankfully salad is a healthy, clean eating friendly option and I love it, I could eat it every day for every meal and I often do. But for those of you who aren’t completely sold, I’m going to share one of my very favorite salads that I make a lot and the best part is I buy everything at my local Aldi and that saves me all kinds of money. I make a big bowl of this and eat on it for several days. Having it made up and in the fridge makes sure I’m more likely to grab it to munch on rather than a higher calorie or less nutritious option when I’m pressed for time. I believe the trick to making a fabulous tasting salad is all about how you slice your veggies. For the lettuce I like to wash the heads and slice the whole bunch like a loaf of bread into no wider than 1/4 inch wide slivers, then turn my cutting board 90 degrees and chop those long strips in half or thirds. For the bell pepper I cut the flesh off the seeds in four or five big pieces and then slice those into very thin, longer strips, about an inch long. The apricots also get sliced into thin strips. I always cut my grape or cherry tomatoes in half, and rather than buying pre shredded cheese, I buy the block and grate it myself, it’s both cheaper and there is no anti caking agent on it. The eggs I cut into quarters long ways and then slice those in thin pieces. Basically, slicing everything long and thin as a general rule is so much better than square and chunky. Again, that’s my opinion, and a matter of personal preference. I also like to leave my salads layered with the cheese on top, that keeps it from getting soggy if a big salad sits in the fridge for a few days. I usually put my layers together in the order they are listed above, except the lettuces, I toss those together. As for dressing, anything goes with this, from ranch to french to Italian. I am personally a french dressing fan, but since it is more sauce like, I tend to use too much. I can modify a lot of habits, but not having enough dressing on my salad is just a no go for me. Making my own dressing would be way more awesome, but to get a little real, I just don’t have the creative flare or the time on a daily basis and it is just very easy to grab a pre-made dressing. 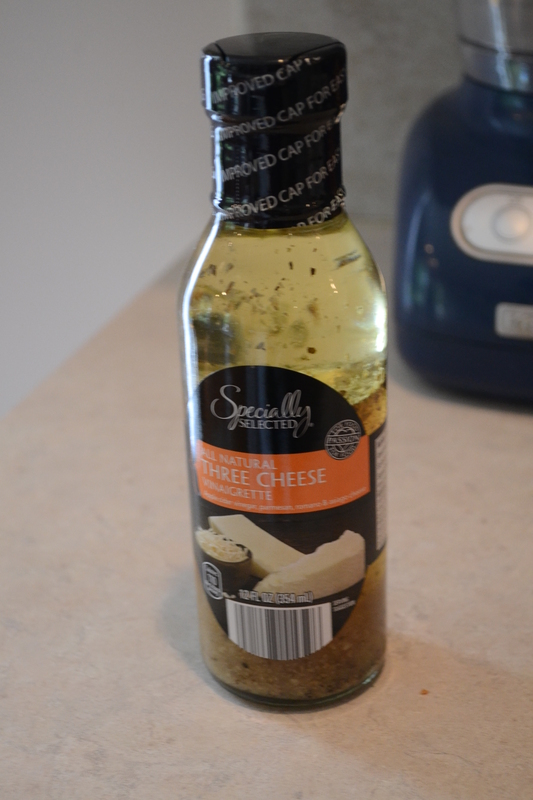 Lately I have been loving Aldi’s brand Three Cheese Vinaigrette. It is delicious and the ingredient list is pretty clean and simple. I like a vinaigrette because it takes less to coat the whole salad. 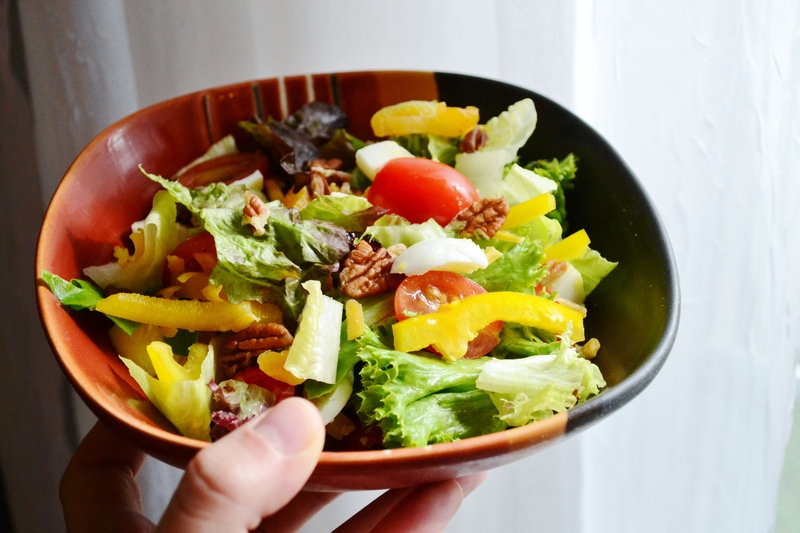 This recipe makes a pretty big bowl of salad, if it’s just me eating on it with or for every meal it will generally last about 2-3 days, and costs somewhere around $4.50 – $6. Not bad for 5-7 meals! A single serve helping, add a dressing of your choice. Day 3! I am still excited, but man! You would think after completing two 90 day challenges and a four week mini that I would not be this sore going back to the beginning, but I am SORE. Anyone else out there feeling it? I find the full minute of rest following only a minute of exercise fairly easy having been used to the 1:30 on :30 off format at the end of 2.0, so I have really focused on increasing my reps. I have gotten some of my best reps and performance the last 2 days and I guess that’s where the extra sore is coming in. I have been staying hydrated to combat the soreness and doing plenty of stretches. I am a Bikini Body Mommy Facebook page stalker once again. I love going to the posts by others section and reading everyone’s comments and getting encouraged by others who are in the same place I am. 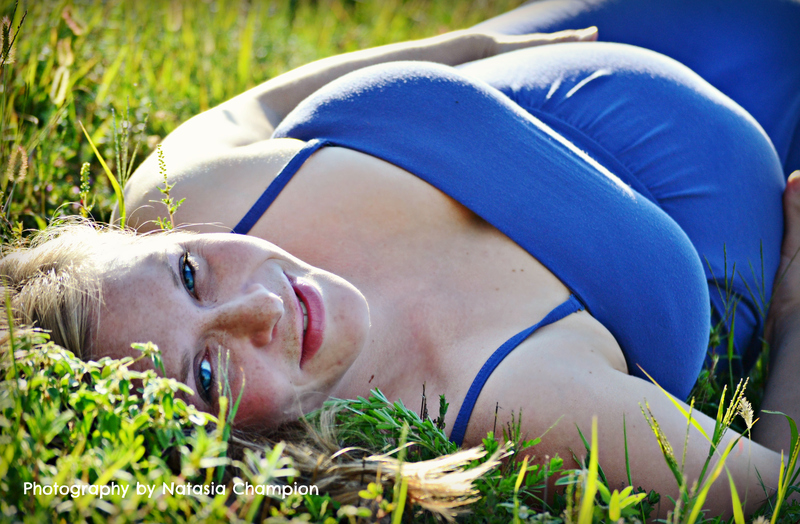 I saw where one mom asked the question about fitting these workouts into a busy schedule. I have to say, if someone had told me a year ago that I would jump out of bed at 5 am every morning, even on saturdays, just so I could have time for my exercise and blogging about my exercise program, I would have laughed. I’m a morning person, but 5 am? That’s the funny thing about this program, I have so much more energy and sleep so much better, 5 am isn’t really that bad. There is just no reason to NOT fit 20 minutes of exercise into your day. You get back so much more than 20 minutes of sleeping in. Day 1 was amazing! I didn’t realize just how much I missed the sweat. I rocked the work out, did a couple of exercises beyond the 20 minutes, took a 2.5 mile walk pulling little man in the wagon and made it in 30 minutes, drank well over 96 oz of water not including coffee, stayed completely on track with my small, frequent, clean meals, and got a ton of house work done. I felt so motivated and active! I’m determined to carry on that momentum after seeing this yesterday. When I finished 2.0 last month on August 2nd, I was proud of how toned and strong my body had become, but I kind of had it in my mind that because no actual weight was lost, my relative size wasn’t much different in my before and afters. I mean, I had trimmed up and toned up, but my jean size remained the same, albeit a better fit. And over the last month as life happened and I lost momentum and kind of told myself it was ok to take a little break (that turned into more of a long 35 day break with only random days that I worked out) both on exercise and way too loose on my nutrition, because my jeans still fit, even if a little more roll creeped up over the top, I told myself there wasn’t much change. When I measured yesterday, my measurements were the same on my arms and legs, and there was only about a half inch gain on each of my chest and core measures. I didn’t think that was much, but after comparing the photos I realized just what a half inch over all looks like. 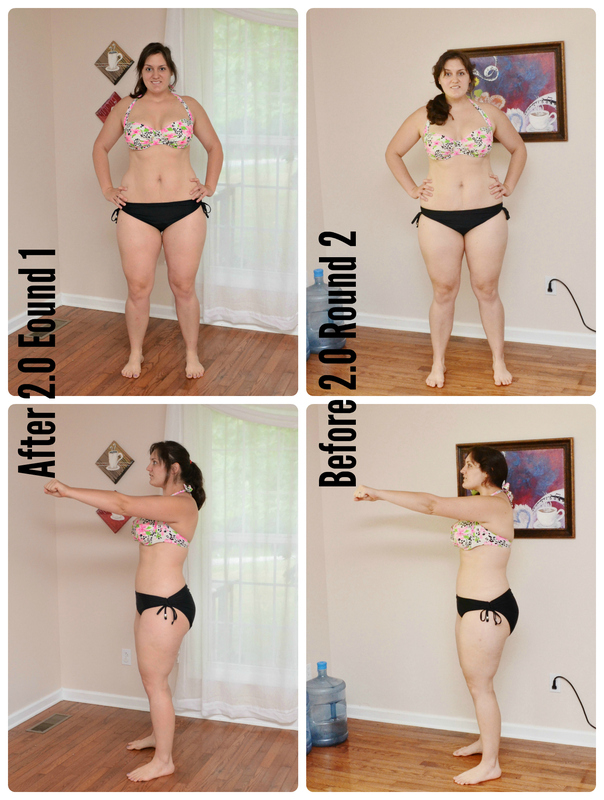 I only gained about 2 lbs, but I see a big difference in these sets of photos. 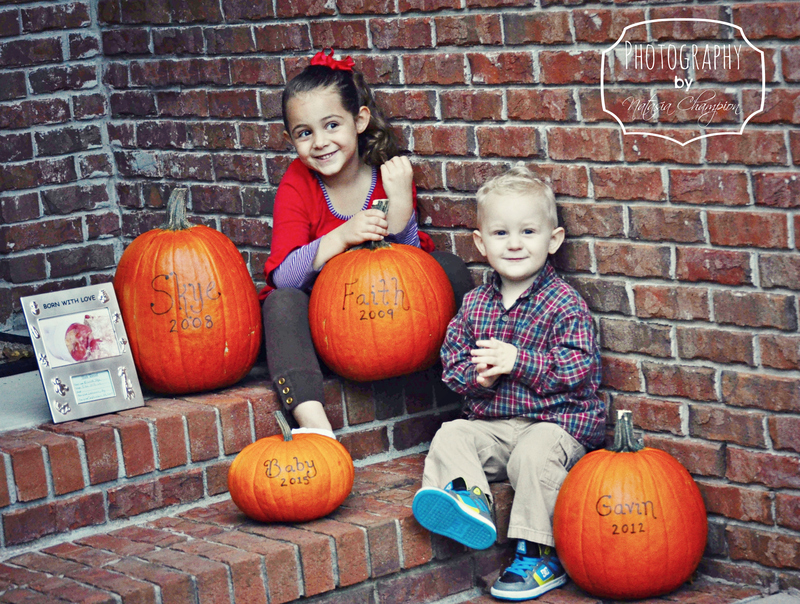 I’m writing this post today for those of you like me who peetered out between challenges. These photos prove it’s a life style. If we look at it as just a challenge, our bodies will begin changing back once the challenge is over. That workout each day makes a difference. That meal structure is important. Taking a break is ok, but 35 days is not a break, it’s a cop out. It would be a shame to work so hard for 90 days and lose all your progress because suddenly you are “too busy” to keep getting your 20 minutes in daily. (That was one of the lines I fed myself this past month.) Note to self: I wouldn’t skip a shower for more than a few days because I was “too busy”, then I should not skip this important part of health and personal care. The littlest bit of progress is still progress ladies. You may not lose weight this round, you may not drop a clothing size, but I promise you, the more defined abs and leaner look of the left side photos above is going to get you to your goals sooner than the backward step of the photos on the right. Take it from a girl who has been there. I’ve said it before, and I’ll say it now at the beginning of this challenge, don’t make this about the scale. This is a journey. It took 6 years for my body to attain it’s mommy of 3 babies and busy life look. 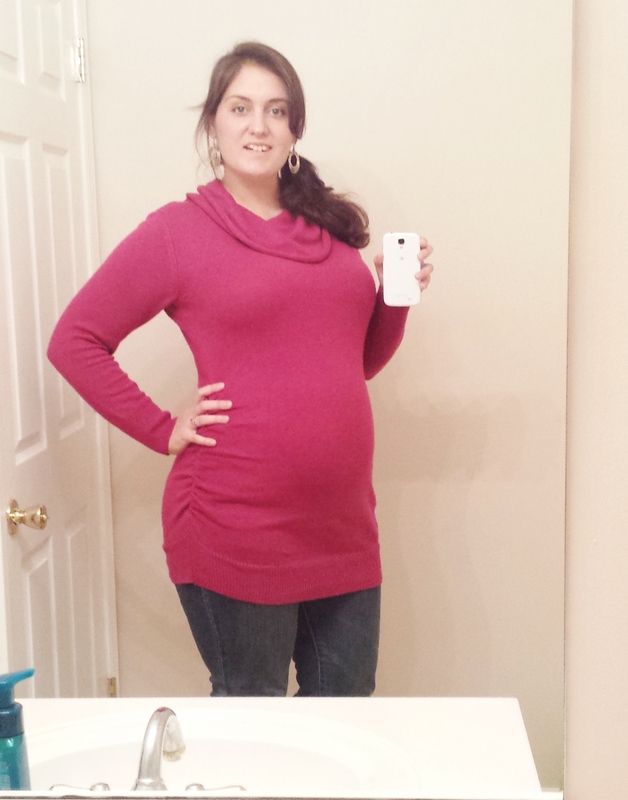 It is going to take more than 90 days for me to get back to a pre-baby weight. For 6 years (and even more, really) I have thought solely of little people and my family where meeting out time is concerned, it is going to take more than 90 days to reprogram my brain to set aside a little time for myself. Don’t give up on this. 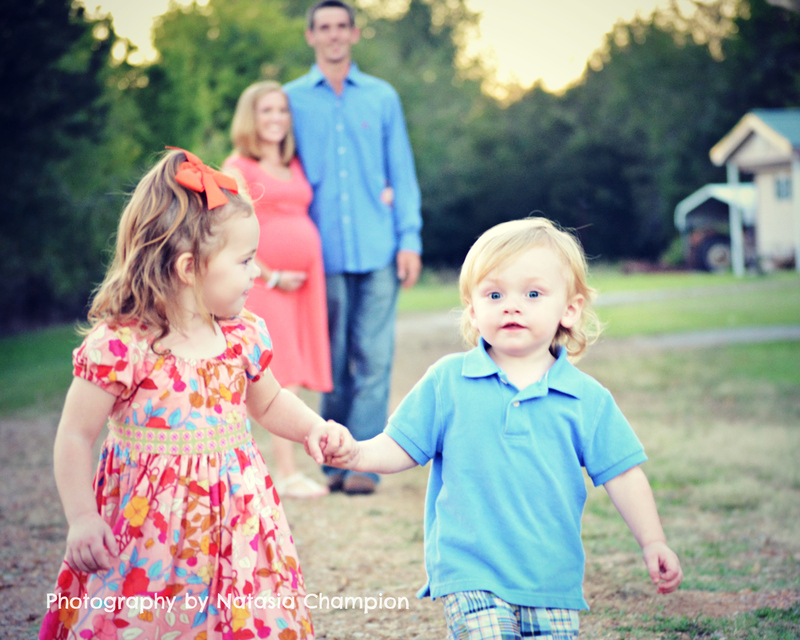 If you are a new-to-the-challenge-mom, don’t be discouraged if you don’t see progress right away. It took me one whole 90 day challenge (1.0) just to get back in the habit of daily exercise and a whole nother challenge (2.0 round 1) to get my nutrition under control. I did not begin to see major change until about half way through the first 2.0, that’s like 135 days!! Just keep going. You will not regret it, make it about the journey because it is so much more than just a 90 day challenge and you are changing SO MUCH MORE than just a number on a scale. You are going to change differently than every other woman, at a different rate, and you’ll need different measures to tweak even this program and make it just for you. It will take time for you to figure out what these are. Don’t get impatient. Don’t quit. I promise you, change is happening, and it will surprise you when you recognize it.